Normally, if a Pivot irrigation system is properly grounded and fuse sizing is correct, there is very little probability of an individual being injured by electrical shock. However, if an electrical ‘short-circuit’ exists on a system, it could be extremely hazardous. To check system for presence of hazardous voltage: use voltmeter with selector switch at 600 volts (AC). Touch one probe to metal of system and other probe into the soil. Repeat test at 120 VAC. If voltmeter shows any voltage, do not touch the system. Check main power source disconnect using voltmeter before placing your hand on the disconnect handle. If disconnect handle is safe, turn off disconnect and call for professional assistance. Lock the handle, if possible, in the ‘Off’ position to prevent someone else from turning the disconnect or system on while waiting for a qualified service-man. If no meter is available for checking a system to see if it is ‘hot’ a possible alternative would be to quickly and lightly tap the back of your hand against a Pivot or tower leg. Physical contact in this manner with a ‘hot’ system will be felt as a ‘rippling tingle’ or ‘jolt’ but should not cause serious injury. A ‘hot’ machine is generally not suspected until someone else has received a shock from it. A good practice to get into is to ‘back hand’ irrigation equipment everytime before you grasp onto it. Insulation breakdown or leak from current carrying conductors to metal, such as motors, collector rings, switches, solenoids, relays, also loose connections, etc. An equipment ground is a low resistance continuous conductor bonded to all metal boxes, through the total system with a driven ground electrode and approved clamps at the Pivot box, pump panel, and back to the power source where it is again grounded at the transformer or generator power source. The maximum resistance of a ground electrode (rod) shall not exceed 25 ohms. Under some sandy soil conditions, it may be impossible to have a resistance as low as 25 ohms. In that case, use another electrode (rod) at least six feet from the first rod and securely bond the two rods together with copper wire og #6 gauge or larger, never smaller. The lower the resistance of the ground installations, the better chance you have of clearing a ground fault on the machine. Minimum size of ground rods shall be 1/2″ x 8″, either copper clad or galvanized. Galvanized pipe is acceptable as a ground rod, but must be minimum 3/4″ inside diameter and must have approved ground rod clamp. 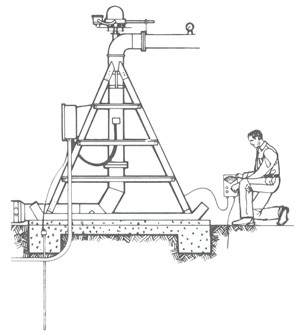 When driving ground rods, if rocks are found above 4′ below the ground, a trench must be dug the full length of the rod and rod buried in a horizontal position just above the rocks. A good method to check a machine for ground fault when machine is energized is to clamp a good “Tong Type” ammeter around the ground wire to see if there is any current flow to the ground. If any reading is observed, no matter how small, avoid contact with any metal parts until the supply circuit is opened. Generator installations must be in accordance with the latest edition of the National Electric Cose. A fusable disconnect with the proper size fuses must be installed at the output of the generator to protect the generator from burning out if a short or ground fault should develop in the underground wire. Proper wire size from the generator to the system should again be emphasized. There must be a properly sized ground wire from the generator to the system. Also, a ground rod must be installed at the generator unit. Equipment that is not grounded properly presents a dangerous hazard to life and equipment. In the design and installation of electrically driven pumps, irrigation systems and other ancillary electrically driven hardware, grounding considerations are critical. All irrigation installations must meet the current National Electrical Code for electrically powered irrigation systems. Some of the items to be considered in design on installation of the system are listed below. Proper fusing and fuse sizing of all electrical equipment. Installation of a slug in the grounded phase of all delta and open delta connected power transformers. Properly fused disconnect on the output side of generator to protect the generator. Every installation shall be of a new and unused material, shall all meet applicable sections of the current National Electrical Code and installed in a good and workmanlike manner in accordance with accepted practice. Meet and exceed the requirements of any agency having jurisdiction over installations.